This lesson teaches the basics parts of a window, window treatments and how to measure for window treatments. It also allows students to physically “make” small versions of different window treatments. These projects make great display pieces for your department’s display case or open house! 11.3.1 Research product information, including but not limited to floor coverings, wall coverings, textiles, window treatments, furniture, lighting fixtures, kitchen and bath fixtures and equipment, accessories, and building materials. 13.3.2 Select manufacturers, products, and materials considering care, maintenance, safety, and environmental issues. 11.3.3 Review measuring estimating, ordering, purchasing, and pricing skills. Scrap fabrics, trims, paper, hot glue, wire, skewers, dowels, cardboard, markers, needles & thread, scissors, etc. PowerPoint lecture and notes. Have students draw the treatments on the handout below. 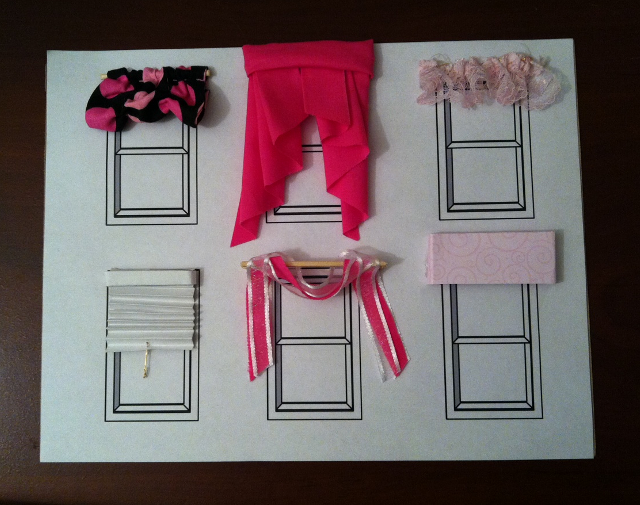 Students will create six different window treatments in 3-D for a double hung window. In my sample I glued the piece of paper with the windows to a piece of cardboard to make it more sturdy. Have students label their window treatments. Without looking at your notes what is a Roman shade? Someone describe to me how to measure a window for curtains.